Enjoy a four course meal hand-crafted by Chef Elise followed by a sophisticated magic and mind reading show, featuring award winning signature routines from Brandon K Parker in the beautiful Wine Cellar at Panzano, located in downtown Denver. Cash only bar. Must be over 21. Brandon is currently performing regularly in several venues around the Denver area. This is a great way to learn more about Brandon's style and see great entertainment at a fantastic price. More venues coming soon! Join Brandon every Thursday at the Broomfield CB & Potts, located next to the flatirons mall for table side entertainment. Just come for dinner anytime between 6 and 8 pm, where Brandon will be milling about the dining room and bar area performing short “shows” at your table. This is a great way to get a glimpse of what Brandon’s close up magic looks like. 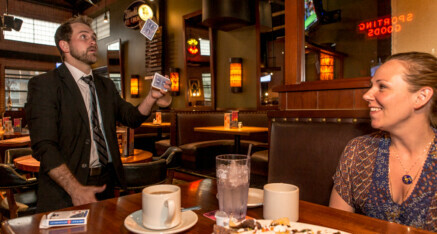 Join Brandon on the first Friday of every month for sophisticated magic and gourmet mexican food. Enjoy happy hour specials all night, a three course meal, and a close up show after dinner in the private banquet room, all for only $29.00 Click on the link below to purchase tickets or learn about Cocktails and Card Tricks. Check out one of these monthly shows and then have Brandon perform at you next event! G. Gordon, D. Neighbors, B. Parker, H. Griffin, R. Rodriquez, A. Lozo, T. Landry, V. Nunan C. Cummings, Dr. Wild, D. Vernon, R.Giobbi, Dai Vernon, D. Ortiz, F. Carlyle, S. Preston, and my mother and father.